To some people, the Psalms seem to be filled with disorganized tid-bits of spiritual insights, stuffed with archaic symbolism. Many parts of the Psalms still appeal to us, but that's mainly because we associate those parts with our own unique experiences of life. We at least think those parts mean something to us, even though most of us, admittedly, haven't taken the time to research the meaning and connection within an entire Psalm, which is what the author intentionally connected piece-by-piece for a purpose. Now, I'm not trying to belittle Christian taste or interests by implying that their subjective feelings and experiences are irrelevant. God does use these Psalms to speak to our individual experiences in life. I am merely trying to highlight the importance of appreciating all the parts together in a given Psalm, not just those parts which we can identify with immediately. It really does appear that some Christians (dare I say many Christians?) view the Psalms with a puzzled look on their face. Many Christians do not actually study each Psalm as a piece of art, much less a well-designed narrative art. If I were a betting man, I would bet that in the mind of the average person, the sheep & shepherd metaphor remains very logical and reasonable up to the point where a table, a head anointed with oil, and an overflowing cup enter the picture. At that point it might appear to us as though the author dropped the sheep & shepherd analogy in order to talk about other pleasant circumstances in life. But actually, there really is a lot more going on in this Psalm than what ordinarily meets the eye -- a lot more imagery that remains consistent with the sheep & shepherd metaphor from beginning to end. A) Yahweh tends me as a shepherd. I lack nothing. B) He lays me down in meadows of fresh vegetation. C) He guides me beside resting waters. D) He brings my life back. E) He leads me along the right paths for the sake of His name. D') I fear no danger because You are with me. C') Your spear and your staff, they comfort me. B') You arrange a table before me in the sight of my predators. A') You anointed my head with ointment. My cup is well-filled. And I shall be brought back to the house of Yahweh for all remaining days. Given this poetic arrangement, there are a number of interesting parallels. 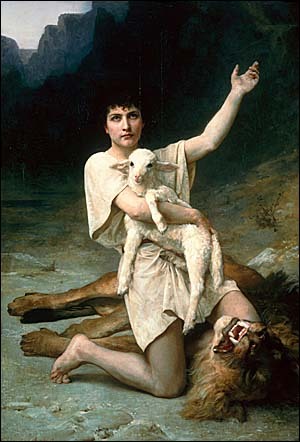 First of all, notice carefully that this Psalm begins and ends with Yahweh tending his sheep: "Yahweh tends me as a shepherd... And I shall be brought back to the house of Yahweh..." This standard bracketing device, formally known as an inclusio, is intentional, as indicated by the opening and closing repetition of Yahweh. It ends where it began, and it begins where it ended. Because of David's concluding remark about returning to Yahweh's house "for all remaining days," it is inferred that the Psalm begins with the Shepherd leading his sheep out His house. Therefore this entire Psalm is describing the daily journey of Yahweh the Shepherd who leads his sheep out into the world and back again into his house, where there is no provision lacking, no cup left empty. The flock of this Shepherd is tended very well. Toward the end of this Psalm, David speaks of his head as having already been anointed with oil. "You anointed my head with oil," the Hebrew says (not "You anoint my head..."). This is interesting because it fits well with the imagery of Yahweh's tender care for his honored sheep and also David's delight in being a servant of God's house. To say that Yahweh has anointed his head with oil is a way for David to acknowledge his gratitude to Yahweh for allowing him to serve and dwell within His house. Here again, the imagery of a "house" to which this sheep may return daily is important. In ancient Israel, it was customary for the master of a house to provide scented, perfumed oil for his guests to freshen up.3 And here David appears to be identifying himself as a servant in Yahweh's house who is treated as an honored guest. As a servant, he leaves for a time to graze along with the sheepfold, but he returns daily to feast in the house of his Shepherd as an honored guest. David lacks nothing; his cup is well-filled. There also seems to be an allusion to Yahweh's anointing of David as the shepherd-king of Israel. After all, David was the young shepherd who "led out and brought in Israel" during the days of Saul (2 Sam. 5:2). The people of Israel even reminded David of this at the time of his anointing as king, saying "the Lord said to you, 'You will shepherd My people Israel and be ruler over Israel.' So all the elders of Israel came to the king at Hebron, and King David made a covenant with them at Hebron before Yahweh, and they anointed David king over Israel." It was also David the shepherd-king who labored to build a "house" for Yahweh (2 Sam. 7:5). But at the same time, it was that same house which Yahweh built for David because of his faithful shepherding (2 Sam. 7:6-13). Here in this Psalm, David not only acknowledges his gratitude to Yahweh for anointing him as a shepherd-king, but also for teaching him how to be a good shepherd-king, treating him as a shepherd-king, and modeling for him the best example of a Shepherd-King that anyone could ever hope or ask for. Because Yahweh is the Shepherd-king par excellence, David lacks nothing; his cup is well-filled. It is Yahweh the Shepherd-King who lays His sheep down in meadows of fresh vegetation and arranges a spread of food for them, even though all of this is done in full sight of nearby predators. I have translated the participle צָרַר as "predators" not only because the Hebrew word is rarely translated as "enemies" elsewhere in Scripture, but also because I was hoping to express it's more concrete meaning of binding and tying a thing without having to separate it from it's usual figurative imagery of one who causes distress and worry; hence, most translations say "enemies" because of it's connotation. (I was considering such alternatives as "snatchers," "sheep-nappers," and "trappers," but I trust that "predators" conveys the overall gist of the imagery.) David knows that meadows of fresh vegetation are surrounded by all kinds of predators, but because Yahweh shepherds him, he lacks nothing; his cup is well-filled. It is also Yahweh the Shepherd-King who guides David alongside resting waters. Notice the placid scenery: resting waters, not fast-flowing, whitewater rapids. Not only does Yahweh provide ample opportunities for his sheep to receive refreshment as He guides them to and fro, but because Yahweh is alongside them, guiding them, there is also peace every step of the way. Yahweh's spear and staff provide comfort and assurance that no harm will befall His sheep. Yahweh is the "Shepherd and Guardian of souls" who brings the life of his sheep back home (1 Peter 2:25). Yahweh leads them along the right paths -- paths paved by the Righteous One -- for the sake of His name. Yahweh knows his sheep by name and his name is known by each one of his sheep (John 10:14). Because of this tender care of Yahweh, David doesn't need to fear the dangers which are lurking in the deadly darkness of valleys at night-time. Yahweh travels with him every step of the way back to His house. Yahweh is his Shepherd who is willing to lay down his life for His sheep (John 10:11). David lacks nothing; his cup is well-filled. But in David's eyes, Yahweh is much more than a Shepherd-King who loves his sheep and provides generously for their needs. Yahweh is generous loyal love himself; and he will pursue his sheep day in and day out with such generous, loyal-love forever. If anyone enters the sheepfold by Him, they will surely be saved and will surely go in and out to find pasture (John 10:9). I nothing lack if I am His and He is mine forever. Perverse and foolish oft I strayed, but yet in love He sought me. In death's dark vale I fear no ill with Thee, dear Lord, beside me. Thou spread'st a table in my sight; thine unction grace bestoweth. And O what transport of delight from Thy pure chalice floweth! And so through all the length of days Thy goodness faileth never. E') Your spear and your staff, they comfort me. D') You arrange a table before me in the sight of my trappers. C') You anointed my head with ointment. My cup is well-filled. A') And I shall return to the house of Yahweh for all remaining days (of my life).